On Tuesday night last at 7pm I headed to the first ever bloggers event held by Inglot in Ireland, designed to promote their Christmas collection. Invitation was simply via a Facebook request so no exclusivity nonsense here. It was well attended by likely well over thirty makeup-and-beauty bloggers, not bad for something organised at short notice and reasonably quietly. Back In The Day when I started out in makeup, I was well impressed with Inglot, a store that had only recently opened in Ireland at the time, out in Liffey Valley in Dublin. At the time, they were offering a generous 20% discount to makeup students, which as far as I know they continue to offer to makeup students and working makeup artists in perpetuity (unlike many of the other discount schemes which are membership/subscription based and must be renewed annually). They have since expanded to other locations (Blanchardstown, Dundrum, Jervis Street, Limerick and Belfast I believe) , and contracted in Liffey Valley (from a standalone store to a, well, standalone stand I guess you could call it). On to the event itself, which was more or less what I expected; a standard meet-n-greet of the staff and SAs, a mini demo (actually two demos of different products used on the same model), some soft-sell of their products, some (quite decent!) goodie bags with freebies, some evil (delicious) M&S choc chip cookies (that I stayed away from!) and plenty of time to browse-n-buy. 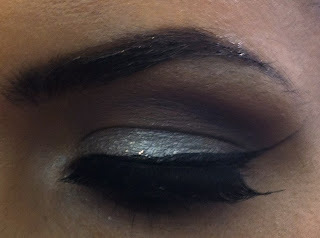 In addition, their 20% MUA discount was extended to all on the night. On to the Christmas collection, which comprised a LE brush collection, some new nail polishes, lip creams, and rainbow eyeshadows. 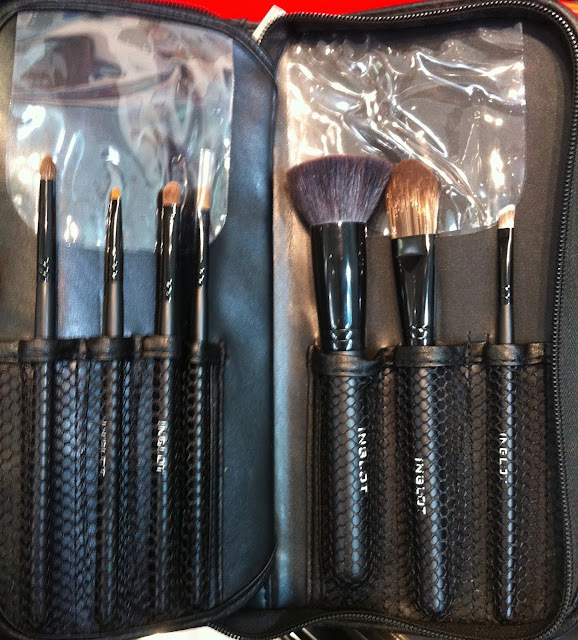 The (well thought out) brush collection retails at €150 for fourteen brushes and a rather nice faux leather carry case. I do feel that the price is pitching on the slightly expensive side for the for the bog-standard punter. 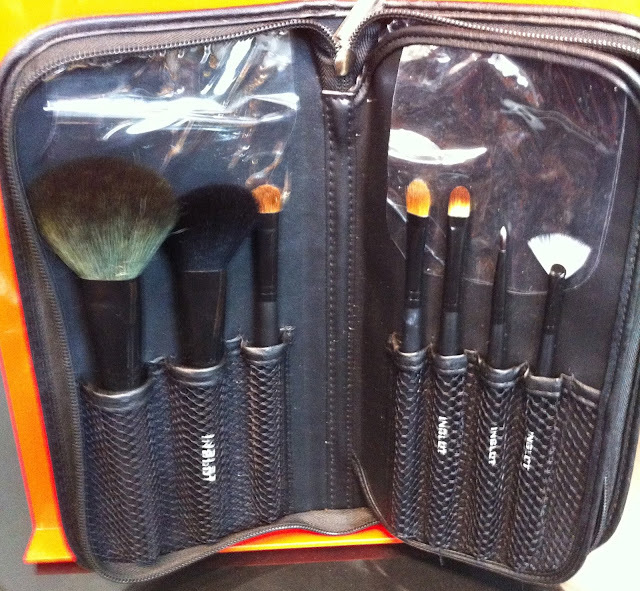 The brushes themselves are all LE and not part of their permanent line, and are a mix of synthetic and natural fibre brushes and would be fine for home use. 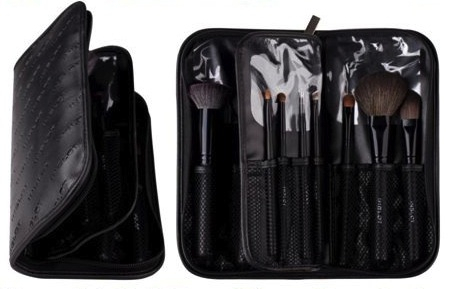 I wouldn't purchase to use them professionally, as I don't feel that the quality of these brushes is comparable with their professional range of brushes (I do have a number of their professional range brushes and the quality of these is excellent). Still, the shape of the individual brushes and overall selection included was extremely well considered; with two exceptions - in my opinion it suffered from the lack of a blending brush or a socket brush. I also particularly liked the case, which is faux leather and zips closed. In addition to the brushes, the lip creams are rather lovely; they come in what looks like a test tube and there are ten shades. They're somewhere between a sparkly gloss and a cream and are highly pigmented. 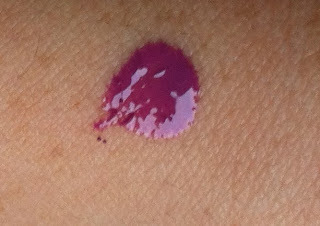 The only part that I personally didn't like was the ultra-strong and very sweet toffee smell; I will just about tolerate gently scented lipsticks/glosses/balms, but this was a bit much for me personally. The lip cream that I got (#109); a fuchsia-based pink. These contain Vitamin E and are supposedly non-sticky (I personally found a them a bit on the tacky/sticky side, but then most lip glosses are somewhat sticky). 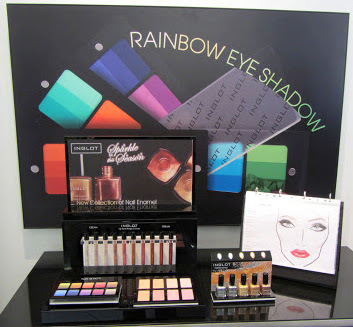 These rainbow eyeshadows have been available for sometime but are just being launched in Ireland. 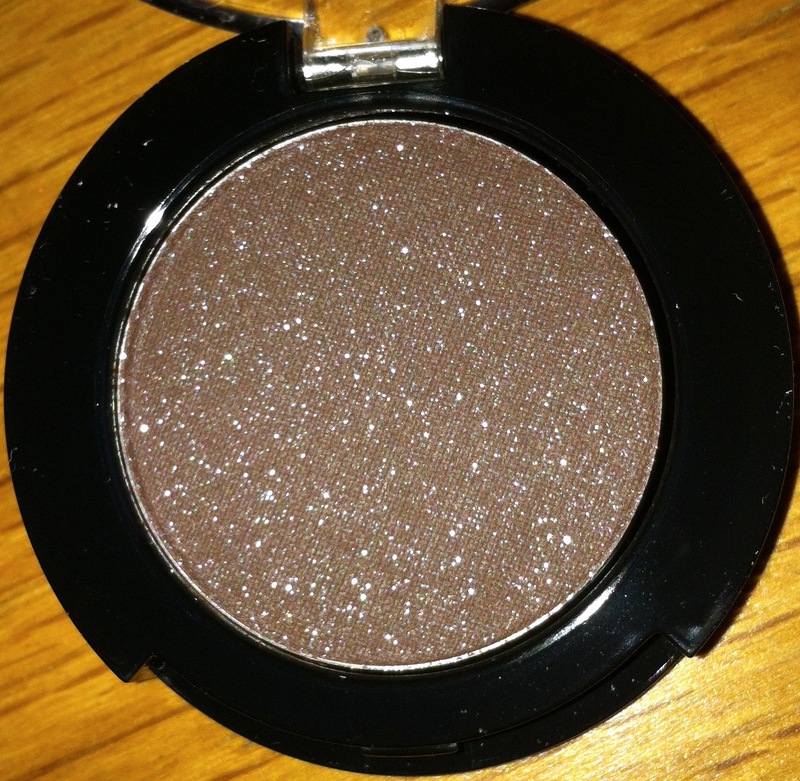 There are of these available to purchase and are quite a good idea as you get three shadows in one. These are square shaped and designed to fit into their new freedom palette system (the old system took round MAC-sized eyeshadow pans). My only gripe with these is that they all seem to be shimmer shades; I'd like to see some matte versions of these. I've found Inglot eyeshadows to be quite good in terms of pigmentation, colour pay-off and blend-ability. These I definitely recommend, if you are a fan of shimmer shades. I personally love metallic nail polishes and the Nail Enamels in the collection are all metallics, ranging from a white-grey silver to a bronze. If I'm 100% honest, I have not been crazy about the formulation of Inglot nail polishes; I have found in the past that while the colours are amazing, they need a bit more work than I'm willing to give them. But I've tried out the free polish we were gifted and two coats of this was more than enough, it wasn't streaky and in terms of metallics, if you don't have some metal shades in your collection, you'll find at least one of this range will work for you colour-wise. One demo, two looks! 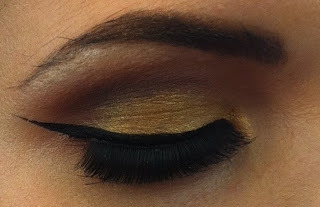 One was a bronzed/gold/brown eye, the other was a silver/grey eye. The lashes used were 30Ns and quite beautiful on. The goodie bags were quite generous and contained a full sized nail polish (the silver one) and a lip cream from their Christmas collection (#109), two full sized rainbow shadows of your choosing (I picked #125 - a trio of brown shades with gold shimmer, and #130 - a trio of grey shades with pink-silver glitter), and an AMC eyeshadow (#53 - a medium brown matte shade with silvery-blue shimmer), a voucher for a free makeover and a sample of their YSM Cream foundation. Nice! I stayed about an hour and a half, then left, after meeting a number of lovely bloggers. At that point I was literally dropping from the heat in the store and from the rather high spiky shoes I'd worn :-) It was an enjoyable way to spend an evening, and I picked up some additonal tips about Duraline (which I will put to use) from Amy, their MUA who was providing her skills for the demo.